Finding the Oneness that connects us all is the most important issue that we are facing right now in our daily climate upon this planet. 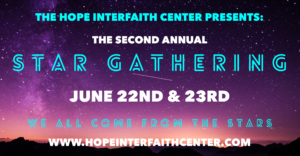 The church/center of the Hope Interfaith Center provides inspiring sermons, music, connections with others who are like-minded and now our Sunday school assists the children. and to know and respect others of different faiths, creed and color. Our ministry focuses on non-judgement towards one another, forgiveness, loving one another, non-dualistic metaphysical truths, connecting to our angels and guides and honoring our beloved ancestors and know that we can create a new, beautiful, and kind Universe. This is our responsibility as Lightworkers upon this planet. The Children’s Oneness School is held the second Sunday of every month at 10:00 a.m., which is during our Spiritual Service. *You don’t need anything outside yourself to be happy. *Failure is fiction. We try different things, make adjustments, and keep moving forward. *You are never separate from God; you are one with all people and all life. *We live in a world of abundance. It is in the sharing, not the gathering, that we receive the most. *You are not required to do or be anything different from what and who you are in order to receive God’s love. God’s blessings are for everyone. *You are perfect and beautiful in the eyes of God just as you are. God doesn’t punish people. Consequences and punishment are not the same thing. *Sharing love with others is the greatest gift you can give to the world. *My way is not the only way to do things and to live. It is only one path in a world of many paths. *There is nothing that you cannot do! Lots of help is available to us. May 2017 – What Happens When You Die? Contact the Hope Interfaith Center at (507) 386-1242 for more information about the Children’s Oneness School.